We are pleased to host the news stream for the pioneering work of Sovereign Grace Churches around the world. My friends, we may not be able to post you their names, but may we all be standing with them and carrying them in our hearts to the One who knows everything about them. May His grace truly abound to this team in this great endeavour. Please pray for Joselo Mercado (Senior Pastor of Gracia Soberana, Gaithersburg, MD) and Kalib Wilkinson (Pastor in Grace Church Frisco, TX) as they head to Colombia, 12th-14th April, to continue building relationally with two key pastors; one from Colombia and the other from Venezuela. Please pray that they’d love these pastors, their churches and countries well, and that God would give them much wisdom and discernment as they consider next steps with both of these dear brothers. Please also pray for the political scene in Venezuela, understanding how difficult things are there at this time. Please pray for Lynn Baird (Pastor in Sovereign Grace Church, Pasadena, CA ), Dave York (Senior Pastor of Covenant Life Fellowship, Roseburg, OR) and Myself as we head to the Philippines, 26th April - 5th May. Whilst there we will be preaching at the Church of the Chief Shepherd Leadership Summit in Manila, on the first weekend. We’ll then be relocating to Cebu to run our second ever Sovereign Grace Churches Philippines Pastors Conference, and so please pray for us and the 80+ delegates that are planning to attend that conference. All these delegates are pursuing partnership with Sovereign Grace Churches and so please pray that this conference is a blessing and encouragement to everyone in attendance. Please pray for the Emerging Nations Church Planting Committees as we begin to process new Church Planting opportunities in Bolivia and Ethiopia, as well as continuing to move forward with other already agreed upon opportunities in Australia and Brazil. We are so in need of His wisdom and leading in this as we move forward together, with at least four church plants on the cards for late 2019/2020. Please pray for Brendan Willis (Pastor in Sovereign Grace Church, Sydney, Australia) as he continues to liaise with Moore Theological College in the putting together of our Sovereign Grace Theological Certificate, specifically designed for our Global Partners, particularly those who can sometimes struggle to get good theological training in their countries. This could be such an important piece for the establishment of Sovereign Grace Churches in other countries and so please pray for this endeavour. Please pray for our brothers and sisters in Liberia. Below is the Church Plant facility that Eric Turbedsky (Senior Pastor of Sovereign Grace Church of Orange, CA) spoke at just a few weeks ago. There was a storm after we left and the building, which also houses a school that they run, completely collapsed. 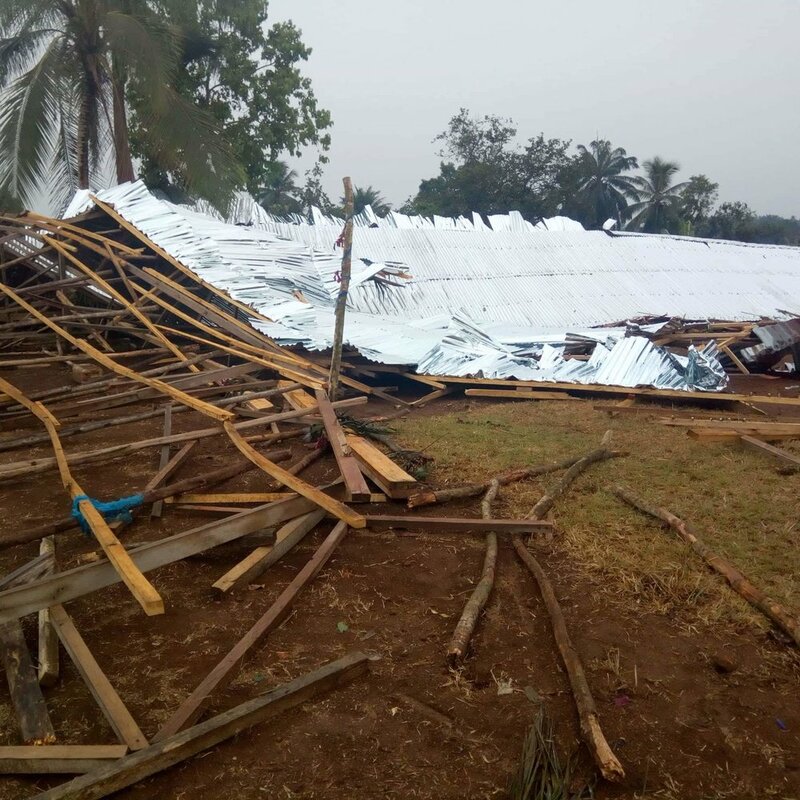 Sovereign Grace Churches have been able to supply the finances to rebuild this before the rains come, which is wonderful news, but they’re still going to need to actually make the rebuild happen. Please pray for Pastor William for grace and peace in this, as well as for speediness for the workers, and that God shows would show them all much favour in this as they begin to rebuild. Another month on and yet the same wonderful and faithful God. For all of us then, may we always ‘keep looking up’. Way back in 2006, I made my first trip to Ndola, Zambia, to visit Wilbroad and Zicky Chanda in my capacity as director of Covenant Mercies. They had recently founded Lighthouse Christian School with a mission to serve orphans and vulnerable children in their own community. A formal partnership quickly ensued, and I have been a regular visitor to Ndola ever since. Wilbroad had become familiar with Sovereign Grace while studying at Reformed Theological Seminary in the U.S. After returning to Zambia, his desire to be part of the Sovereign Grace family grew, eventually leading him to plant Christ Community Church in Ndola. As we have gotten to know Wilbroad through the years, his gifting/calling to train and equip other pastors for the work of ministry has become increasingly clear. As a result, Sovereign Grace (especially the Northeast Region) has stood with him in his vision to formalize a Pastors College in Ndola modeled after the Sovereign Grace PC. Thus was born the Copperbelt Pastors College (named for the Copperbelt province in Zambia, of which Ndola is a part), with the initial goal of equipping a small group of aspiring pastors who may be called to plant churches in the region. As word of Wilbroad’s pastoral training efforts spread, an increasing number of students expressed their desire to be involved; many of them already functioning as pastors, but with very little training. Rather than turn these men away, Wilbroad decided to absorb them into an ever-growing class, eventually dividing into morning and evening streams so that all could be accommodated (classes are typically held on evenings and weekends, since most students occupy full-time jobs and/or carry significant ministry responsibilities). In time, the class grew to more than 60 committed students. Five different Sovereign Grace pastors have flown in to teach weeklong modules. In the end, the class received the essential theological content of the Sovereign Grace PC curriculum over the course of about three years. Earlier this month, I had the great blessing of participating in the graduation ceremony for this inaugural class. It was a joy to commend them for the diligence, hard work, and sacrifice I have observed over the past three years. They have truly “studied to show themselves approved.” While this won’t result in 60 Sovereign Grace church planters, a few graduates will have internships at Christ Community Church in the months to come, and we pray that some will plant churches and play a part in the formation of a new Sovereign Grace region in Zambia/southern Africa. It has been a humbling and inspiring experience to observe the diligence and commitment of Wilbroad and these students for the past several years. We pray that this “day of small beginnings” will continue to grow into a work that equips many more pastors and leaders in the years to come, for the glory of God and the strengthening of His church in this region of the world. In 2012 Dyonah Thomas (Lead Pastor of Grace Life Church & Founder of Grace Network) heard the song “Let Your Kingdom Come” by Bob Kauflin. He loved it and wanted to know the story behind it, and that led him to Sovereign Grace Churches. Over the past few years our friendship has been deepening. I have had the privilege of mentoring Dyonah and so in heading on this trip I had high hopes of what we would find in and in every way this trip did not disappoint! 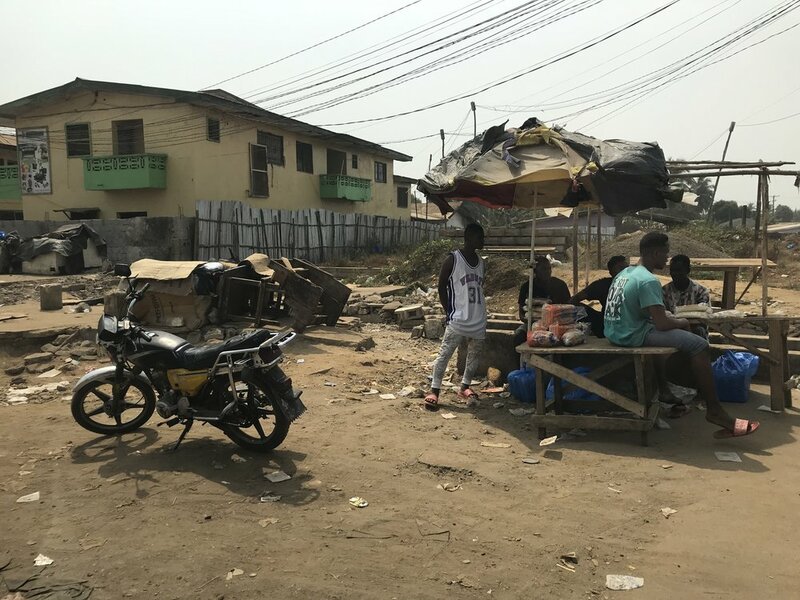 In March of 2019 Eric Turbedsky (Senior Pastor of Sovereign Grace Church of Orange, CA), Ben Kreps (Senior Pastor of Living Hope Church, PA) and Myself, got on a plane and made the trip Monrovia (Liberia, West Africa). Dyonah is himself a Lead Pastor and Church Planter, having planted 8 churches in Liberia. He also leads a Bible College with over 85 students and is eager, as are we, to work out what partnership with Sovereign Grace Churches would look like in Liberia & other nations in West Africa. That’s why going on this trip was so important to us and so we attended with eager anticipation. Over the week we had the privilege of teaching at the Bible College. Over 100 Students and Pastors had come in from Liberia & other countries in West Africa. During that time we had the privilege of teaching on ‘The Life & Ministry of Jesus’ and ‘The Life & Ministry of the Pastor’. In addition we had the privilege of speaking at Dyonah’s Church and a couple of his Church Plants on the Sunday, aswell as get to know the Eldership of Grace Life Church, a very special and dear group of men. Please pray for this dear Church and this group of Churches going forward. They are eager to partner with us, as we are with them, and so please pray for us in this new initiative and endeavour. It is truly an honour to be involved with Grace Life Church and Grace Network. Just came back from Argentina. Very encouraging time. I was able to translate for John Piper in the Ante Su Palabra Conference, and there were over 1,000 people and thousands watching over the internet. I was able to spend significant time with Pastor John and was very much affected by his evident love for Christ that is fuelled by his view of Christ as the greatest treasure. It was very encouraging to be approached by over two dozen people at the conference to thank me for sermons, articles or interviews that have affected their lives. Also, two pastors came to encourage me, each one with a story of people getting saved by a sermon I preached two years ago in Argentina. So encouraging. All glory be to God. Italy is a country of over 60 million people, with less than 1% evangelical gospel witness. By God’s grace, Sovereign Grace has a growing window of opportunity to serve gospel progress. CrossPointe Church in Arnold, MD has been building relationship with Verità di Grazia (VDG), which means Truth of Grace. VDG is a reformed-continuationist church in Chiavari (a metropolitan area of over 40,000 people near Genoa) that was planted by Lee and Jeanette Walti, Americans who have been living there for over 10 years. CrossPointe’s lead pastor, Ed O’Mara, has built a friendship with Lee and Jeanette. In 2017 CrossPointe brought the Walti family to Arnold to deepen the relational ties and then to the Sovereign Grace Pastors Conference to equip and care for them. This relationship has been a means of grace and refreshment for the Walti’s as they labor in the gospel in a need place. It has also afforded Lee and Jeannette the chance to begin relationship with Nathan Smith, who serves Sovereign Grace by helping coordinate missions in Europe. In the summer of 2018, CrossPointe sent a team of 17 people (including a couple from Living Hope in Bowie, MD) to serve at VDG’s annual “KidzGames.” Over 140 children heard the gospel clearly proclaimed in a fun environment. Additionally, members of CrossPointe were able to build relationship with members of VDG and encourage them in the faith. During that week, elders from CrossPointe also met a church planter from Sicily who shares Sovereign Grace’s theology and values, and since then Ed has continued to build relationship and support these dear pastors. Since then, Larry McCall, of the Christ’s Covenant Church in Winona Lake, IN has agreed to lead a marriage equipping context in April 2019 in Chiavari. In addition to serving VDG, this conference will include other Italian pastors who share Sovereign Grace’s values and a love for the gospel of Christ. Then, in the summer of 2019, the Mid-Atlantic Region has joined together to share labor and support of three different missions trips, with KidzGames in Chiavari being one context that members of Mid-Atlantic churches can participate. While these are small beginnings, God is doing a good thing a need place! Please pray for Joselo Mercado (Lead Pastor of Iglesia Gracia Soberana in Gaithersburg), as he translates at the Ante Su Palabra Conference in Buenos, Argentina (1st-2nd March) for Dr John Piper. Please continue to pray for Eric Turbedsky (Senior Pastor, Sovereign Grace Church, Orange, CA), Ben Kreps (Senior Pastor, Living Hope Church, PA) and myself, Dave Taylor, as we serve in Liberia, Africa, through to 9th March, to serve our good friend Dyonah Thomas. Whilst there we’ll be teaching over 110 pastors who will be attending their Pastors College for that week, teaching in some of their Grace Network Churches, and continuing to develop and strengthen our partnerships with the brothers there. Please pray that God would give us wisdom in how to best steward our growing partnership with Dyonah and the churches he serves in West Africa. Please pray for Wilbroad Chanda (Senior Pastor of Christ Community Church in Ndola, Zambia) as he and the team in Zambia prepare for their very first Pastors College Graduation Ceremony on 12th March. Please pray for Bert Turner (Executive Pastor of Covenant of Grace Church, Ohio) and Larry McCall (Pastor in Christ’s Covenant Church, Indiana) as they head to Brazil, 1st-13th March. They’ll be a week with Fabiano and the Sovereign Grace Church plant in Sao Paulo, teaching through our Sovereign Grace shared gospel values material. They’ll then be heading to Rio Grande, the southern state of Brazil, to meet with some other like minded pastors who are keen to talk more about partnership with Sovereign Grace Churches. Please pray that Fabiano and Marcia would be greatly encouraged and strengthened from this time and that God would be glorified in all that takes place on this trip. Please pray for Brendan Willis (Pastor in Sovereign Grace Church, Sydney), Jeff Purswell (Director of Theology & Training), Josh Blount (Pastor in Living Faith Church, Franklin, and Member of the Theology Committee) and myself, as we continue to think through "all things theology” and what this looks like in a growing global family of churches. We are dependent and eager to see what the Lord has for us in each of these things. Thankyou so much for your prayers, may His grace abound to us all! Mario & Jen Vucenovic were first sent out from their home church, Christ Community Church of Reading, Pennsylvania in 2016. Mario is passionate about sharing the glorious gospel of Jesus Christ and teaching the Word of God. His desire is for his people to know the hope, joy, and peace we have in Christ, what he himself simply never knew as a young boy growing up in Croatia. To that end Mario planted Church of God’s Grace in Zapresic, Croatia, and began holding regular services in January of 2018, with just six adults and eight children. In what is such a difficult country for gospel mission, God has been so good to them, has blessed them in so many ways, and continues to establish the fruit of their hands by His grace. What a privilege it is to partner together in this way as Sovereign Grace Churches. On January 11th and 12th I was able to spend two days with over 50 couples on the subject of the centrality of the gospel and marriage. Pastor Junior Martinez of Iglesia Bautista La Gracia invited me to share on the topic. The church is in Yauco in the south west side of the island. Pastor Junior was one of the Pastors that we provided with a generator last year and the church was not able to meet for a considerable amount of time because the bridge that connected the community was washed out by the storm. It was a very encouraging time. The teaching was able to help them to see how the gospel changes who we are, in our identity, to be able to walk according to the Gospel. Many of them let me know that this was something new for them but they can see how significant it is for their marriage and for their walk as believers. In the coming months we will go back to the island to continue to help pastors apply the Gospel to everyday life. In May we will have a bible interpretation workshop with more than 70 pastors, in conjunction with Simeon Trust. In August I will teach at a masculinity conference and in October I will travel with Jared Mellinger to do a preaching workshop for pastors. God is at work in the island and Sovereign Grace Churches are helping pastors to apply the gospel to their lives and ministries. Thank you so much. I am excited to announce that we have raised up a team of 28 men and women along with 15 kids to be the Launch Team for our upcoming church plant. We will be planting into an area of Sydney called ‘Parramatta’, which is 25 minutes down the road from our home church, Sovereign Grace Church Sydney. It is a strategic area because of its rapid growth, its proximity to the sending church, and there is much need for more gospel preaching, gospel celebrating churches in the area. My wife, Maddison and I joined the church in Sydney in 2013 after we moved into the area. We now have three children, Evie (6), Jasper (4), and Judah (9 weeks!). When I first joined the church, I spoke with Dave Taylor and shared with him my sense of calling to pastoral ministry and a desire for church planting. Dave began mentoring me, giving me opportunities to preach, and lead, and eventually brought me onto their Core Team. In all that time, the team was assessing whether I was called to ministry and specifically to serving with Sovereign Grace in Australia as a church planter. By God’s grace, we passed the test and our church raised the finances to send us to the Pastors College in 2017/18. They have now taken me on as an intern to prepare me for the church plant and to complete my ordination. We now feel as though we are an in position where we are ready to transition to leading this new team and begin a new gospel venture in Parramatta. In the very first service of Sovereign Grace Church Sydney on September 5th 2010, Dave Taylor prayed for their first church plant, asking the Lord to make it happen! Now, God willing, Sovereign Grace Church Parramatta will launch in September 2019, 9 years later! In the next 6 months, the launch team will meet weekly for training, fellowship, and equipping for the task ahead. Myself, my wife, and kids, and the members of the Launch Team, that God would unify us, equip us, and protect us for the journey ahead. For a location for our church plant to meet in. For the finances to fund our venture. I will be going down from full-time to 3 days a week to ease the financial burden on the budget, so please pray for provision of work for me, and the ability to go full-time as soon as possible. Please pray for Riley Spring (Church Planter - Sovereign Grace Church Sydney), as he begins weekly meetings with the Parramatta Church Plant Team ahead of the church plant launch on Sunday 8th September. Please pray for Kyle Huber (Senior Pastor of Greentree Church & Co-Founder of SEE Global, Belarus) and Nathan Smith (Senior Pastor of Grace Church Bristol, UK) as they make a trip to Belarus, 18th-25th February. They’ll be meeting with key church leaders who Kyle’s known for a number of years now, to assist them in the planning of training for their leaders as they seek to raise up more church planters. As well as identify pastors who may be well served by a growing relationship with Sovereign Grace Churches. Please pray for C.B. Eder (Senior Pastor, Christ Community Church, PA) and John Reyes (Pastor, Christ Community Church, PA) as they head over to Croatia, 4-11th February, to visit with and encourage Mario & Jen Vucenovic, as well as Daniel & Kaitlyn Crocker who were sent out to support them as missionaries. Please pray that God would refresh the Vucenovic's and Crocker's, and that our Sovereign Grace Church in Zapresic would be greatly encouraged through our gospel partnership. Please pray for Eric Turbedsky (Senior Pastor, Sovereign Grace Church, Orange, CA), Ben Kreps (Senior Pastor, Living Hope Church, PA) and myself, Dave Taylor, as we head over to Liberia, Africa, 27th Feb - 9th March, to serve our good friend Dyonah Thomas. Whilst there we’ll be teaching over 110 pastors who will be attending their Pastors College for that week, teaching in some of their Grace Network Churches, and continuing to develop and strengthen our partnerships with the brothers there. Please pray that God would give us wisdom in how to best steward our growing partnership with Dyonah and the churches he serves in West Africa. Please pray for ongoing safety for our Pastors around the world, particularly those in unreached nations, or nations hostile to the Gospel. Thankyou so much. May His grace abound to us all! I just wanted to give you a brief update on our first meeting that took place just a few Sunday’s ago. God was very kind to us and we felt his presence with us! The morning was joy-filled and Christ-exalting. I preached from Luke 24:13-35. The feedback on the whole service was encouraging. People appreciated the simplicity of it and enjoyed experiencing the leadership from Sean Taylor, Sheldon Campbell, and me. Sean and Sheldon did very well. We had a total of approximately 40 adults and a good number of children. Some of our guests were friends and family who are committed to other churches. It was wonderful to have them with us for our first service to celebrate God's faithfulness to us during these past several years of training and preparation. It was especially encouraging to have 3 families who live in the immediate area, 2 of whom we had not met face-to-face before, as well as a few families who live in nearby communities. One wife who lives in the area said to me, "I'm glad that you all are here." Another family from the area has committed to coming again. That was very encouraging to me, especially as I continue to lead our core team, most of whom travel from Kingston to work alongside us. The team worked willingly and diligently to set up and to serve our guests. They are a great blessing to us. Please pray that we'll care for them well during these demanding first few months. And please pray for us as we continue. This Sunday, I kick us off a preaching series in Colossians, with Sheldon and Sean preaching in consecutive weeks after that. Again, we are so grateful for your partnership with us. Sovereign Grace Church Sydney celebrates another year of grace!